Travis Chen (cello), age 14 when he won the Khuner Competition, was a student of Sieun Lin, on the faculty of the San Francisco Conservatory of Music. Travis’s achievements included receiving the 2009 James Denver Gary Instrumental Award from the Pacific Musical Society as well as winning the 2009 Menuhin-Dowling Competition for Young Musicians. In March 2007, he performed with the Fremont Symphony in their Children’s Concert series featuring Young Artist Competition winners. 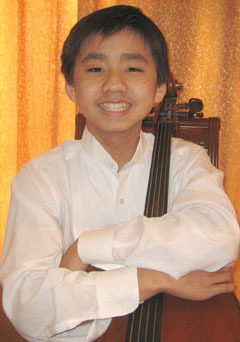 Other accomplishments include first place and best Chinese piece award in the 2007 and 2009 Music Teacher’s Association of California Competition, first prize in the Music Teacher’s Association of California’s VOCE in 2006, participant in the Junior Bach Festival concert series in 2007 and 2009, and in 2011, second prize in the Diablo Symphony Orchestra’s Young Artist Competition.